This tutorial will learn you how to create a simple layout containing a wallpaper in the background and a calendar object. Start Wallpaper Cycler and add some wallpapers or open an existing wallpaper cycler list. Click on "My Layouts" in the tree on the left of the main window. Choose "Layouts > Add Layout...". The layout editor is now opened and we can now start creating our layout. To start with, give this layout a nice name with the properties bar at the right of the window. For example: "Tutorial Layout 1". Then, choose "Objects > Add Wallpaper Object" and drag a rectangle on the drawing canvas by clicking the left mouse button, moving the mouse and releasing the left mouse button. Afterwards, you can click the object with the left mouse button and move the object to fit it nicely in the upper-left corner of the canvas. 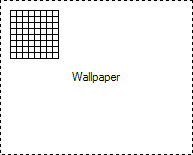 Then click with the left mouse button in the little black rectangle in the lower-right corner of your new wallpaper object to resize it to fit the light gray canvas. (optional) If you wish to customize your calendar object, select your new calendar object by clicking on it and then click on "Edit..." In the properties bar on the right of the layout editor. A new window will appear allowing you to customize your calendar. Use the "Import..." button to import a preset. There are some presets installed in your Wallpaper Cycler folder. Once done, close the calendar editor. Our layout is now finished, so we close the layout editor. The layout is now ready for use. To try it out, open a wallpaper category, click with the right mouse button on a wallpaper and choose "Set As Wallpaper Using Layout > X" where X is the name you gave to your new layout. Give comments on this tutorial by clicking on the "Post Reply" button at the bottom of this page.